Before written language, humans conversed with the wild. Hunters mimicked the cadence of beasts they might eat. Gatherers fashioned tools and made things grow. Fathers and sons, mothers and daughters, made community around the fire. The lessons the land taught were elemental. So were the materials it provided: wood for carving, hides for tanning, alloys for the forge. The things man made were lasting. Piggly Wiggly can feed us now, and we spend as much time in airports as we do in the cypress swamp. Very few of us carry Bowie knives into the boardroom. The stakes have changed, but the wilderness still beckons. The father dressed his young son in his grown man’s canvas waders, the waist rolled down half a dozen folds and cinched with a braided rope so they would stay up. Boots five sizes too big, such that young Raggio would wear eight pairs of striped baseball socks to make them fit. This was their American pastime. Their passport to the primeval flooded timber sloughs – known as green timber – where they did their hunting. 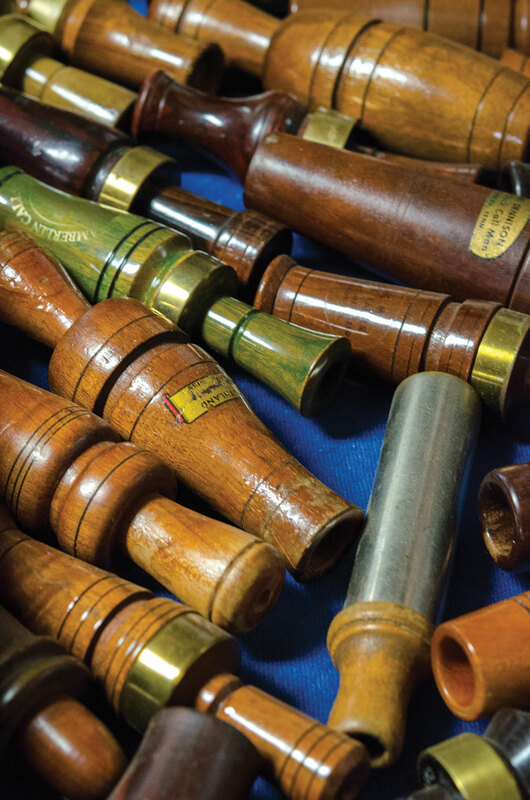 Doing it the hard way is what makes Raggio Custom Calls special. It’s the idea that values and quality—the type a father passes to a son—are resilient and inexorable. Bulletproof and watertight. 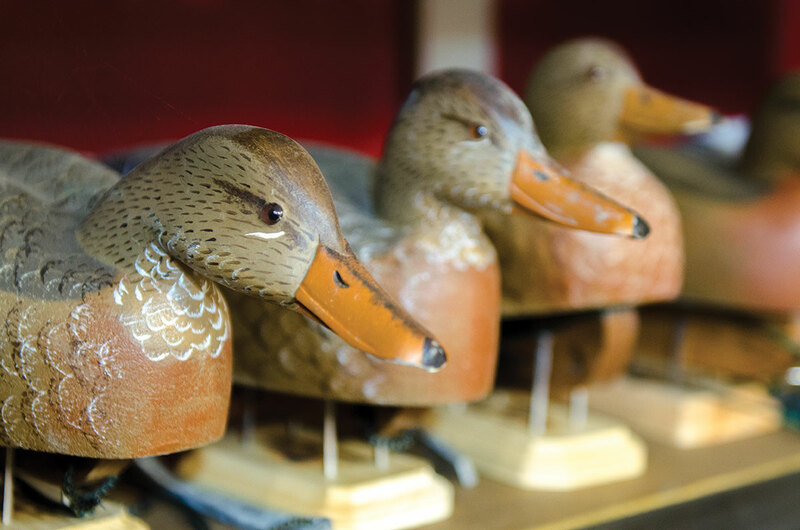 In the world of duck hunting, Raggio is a protector of these customs. He’s is a sinewy thirty-seven. A good ol’ boy with tattoos: a duck call on his forearm, trees (“be well rooted”), and arrows (“aim straight”) among them. 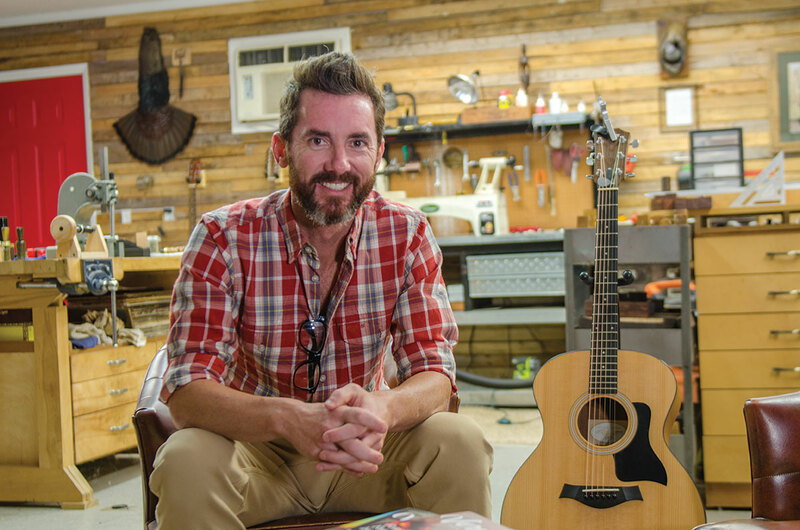 He’s the type of guy that belongs in the pages of Garden & Gun – which is fitting, since it was a mention as the 2014 Made in the South Awards winner that sent the business into overdrive. Raggio makes calls from woods like African Blackwood and Cocobolo – the same materials that compose high-end clarinets. Yellow Cedar is another staple. He’ll pay as much as a hundred dollars for a five-inch blank before he even begins to turn the wood. It comes from places like Indonesia, where local mountain men ride out on horseback to source the choicest woodgrain. In the beginning, he hadn’t intended on selling them. He wanted to make one for his father, for his friends. 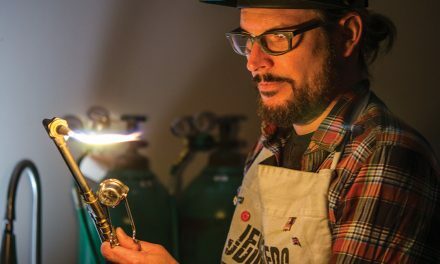 “I wanted to make one for myself to prove I could do it, and one for my dad, and maybe a couple of buddies.” Now, he makes about two hundred calls a year, for clients that include Major League Baseball players (turned from their wooden bats) and Dallas Cowboys’ owner Jerry Jones (Arkansas Razorback-themed, with tones of white and red). On his shelf sit three calls made of African Blackwood with white sapwood veins. These are for himself, his father, and his young son. My niche is I still hand turn every call. I’m the only person that I know of in the country that does this full-time that only hand-turns duck calls… Very traditional. No stickers, no laser engravings. I’ve been recognized basically by the shape of my call. And that’s how I wanted it. Last April, Seattle-based outdoor outfitters Filson messaged Raggio about his calls. He made them a set of twelve calls for their flagship stores which sold out before they’d even shipped. 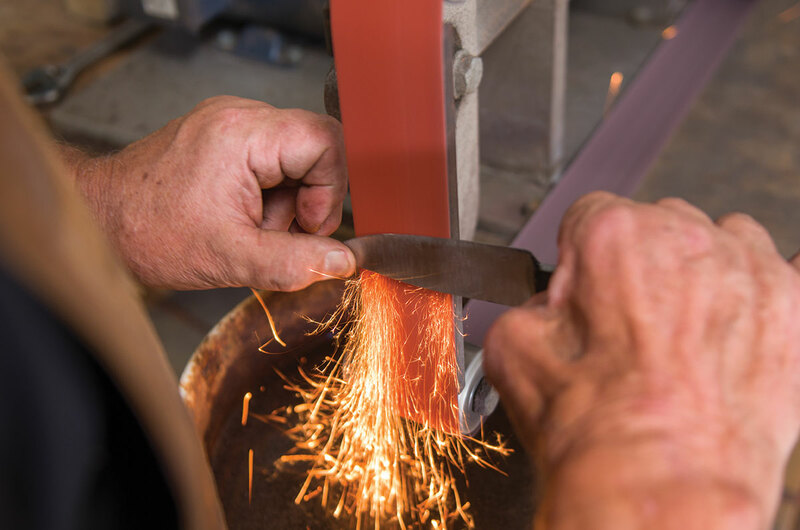 There are more Filson calls in the works, packaged in hand-stitched tin cloth pouches that Raggio’s mother made out of an old pair of her son’s pants. Raggio is one man. He has no employees. He handwrites a letter to each customer that he includes with every call he ships. He still writes your address—no printed shipping labels. If you’re Raggio, why quit a steady corporate career and commit your days to making duck calls by hand? Well he loves it, for one. It’s not work for him. He believes, like all true outdoorsmen must, that the hunt is not just about the kill, it’s about the experience. And then there’s his father. The man who taught him to call. The man who cinched the belt around Raggio’s over-sized waders and took his son into the wild to learn about life and death. So that he might know what it means to truly live freely, whether that’s outside in the early-morning dark when the wind is biting and man and nature are one in the same; or inside, in the workshop, where one can be his own boss, where the nine-to-five is but an echo of memory, where he can carve into being his own path, in the form of a little woodwind instrument that fits in your pocket and makes mallards come. 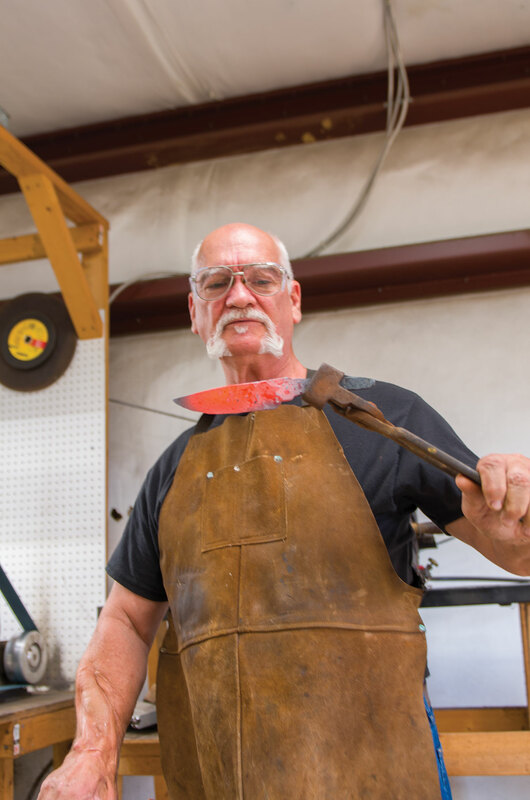 Terry Vandeventer made his first blade when he was ten years old. He found a flat sheet of floppy scrap and, with a borrowed hacksaw from his neighbors tool shed, cut the metal into a point. Then he ground it on the sidewalk—scrape after scrape—until he had fashioned a blade. He took two pieces of wood for a handle, drilled two holes, and melted lead fishing sinkers on the stove to make his pins. And then he carried his homemade knife around the neighborhood like a knight on the Crusades. 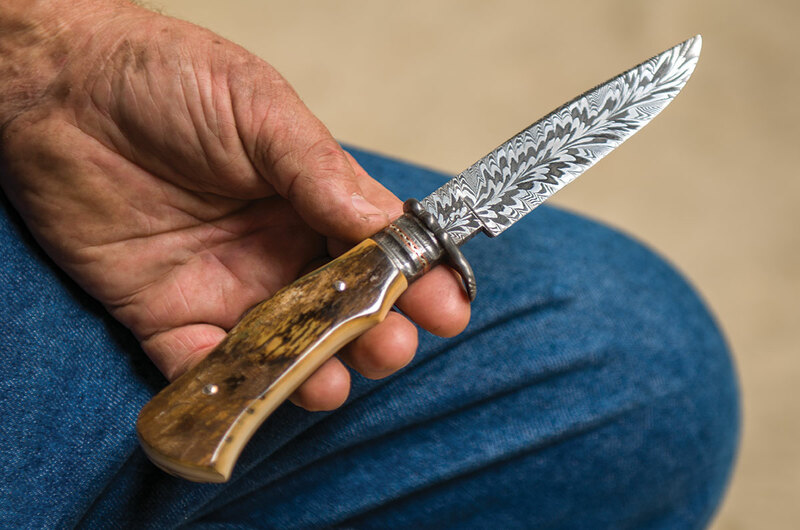 Now, Vandeventer makes his blades in his Byram, Mississippi shop with premium knife steel, a hammer, and a forge that heats up to more than a thousand degrees (and, when he’s preparing damascus steel, more than thirty-two hundred). 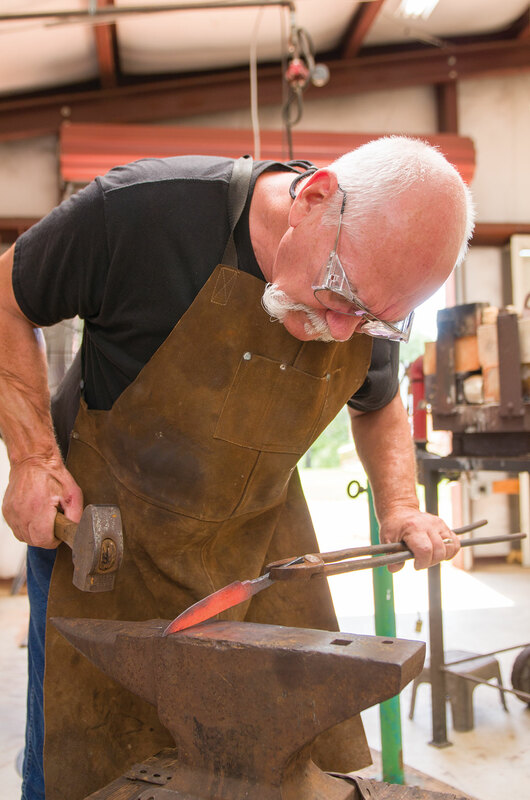 He’s the only Master Smith in Mississippi, designated by the American Bladesmith Society. 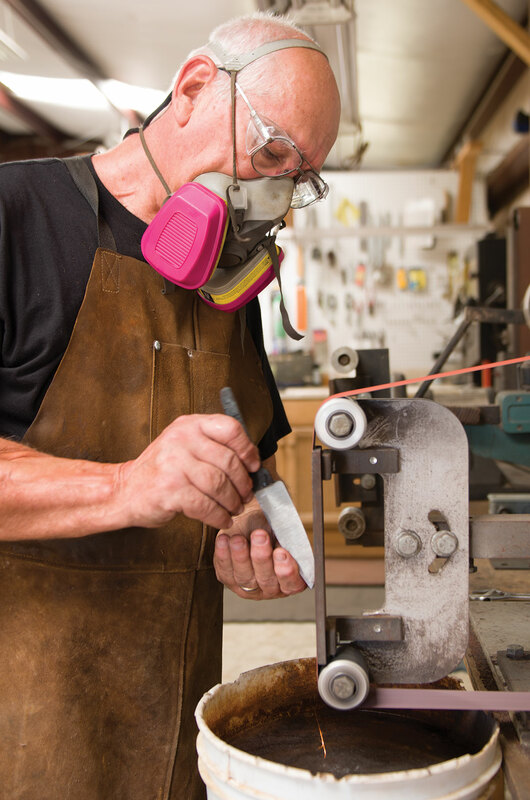 He’s one of just one hundred eighteen such Master Smiths in the world. The mustached man is also a respected herpetologist and snake handler who has spoken to over a million children in his career. “Being a natural historian and loving all things wild and crazy and out in the woods and jungles, I always had a knife with me,” says Vandeventer. 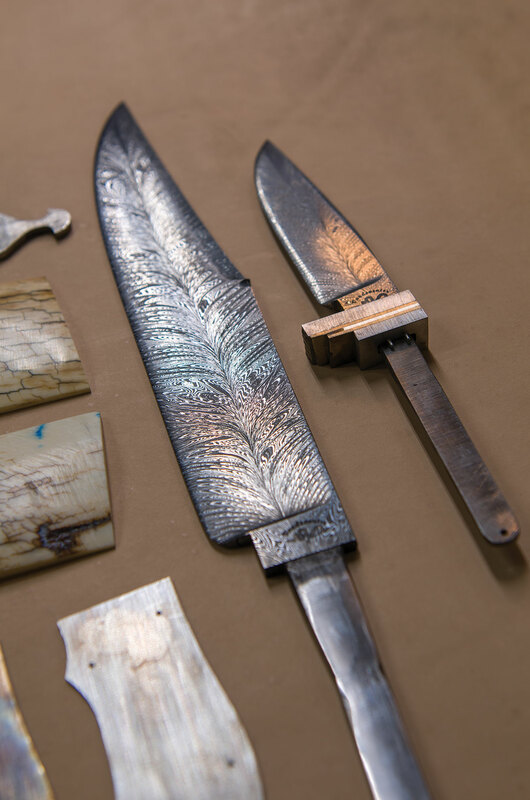 “I always do fancy,” Vandeventer says, as he stacks varieties of steel atop one another, the first step in the forge-welding process that creates the contrast and topography of Damascus. As the different steels are stacked, heated, and hammered out, their molecular structures coalesce. Once they have become blades, Vandeventer dips them in acid, and the magic happens. This is high art, but it’s grounded in the history of the common man. The knife is mankind’s most ubiquitous and important human tool. You can’t cut grain without a knife to feed yourself. You can’t clean and butcher animals. You can’t make clothing and leather goods without some kind of a cutting tool. Scissors are knives. You can’t do surgery without a knife. It is the most important thing that’s ever been developed by the human animal. If there is a king of the jungle in the land of knives, it may be the Bowie. It’s a Mississippi knife, large and intimidating. 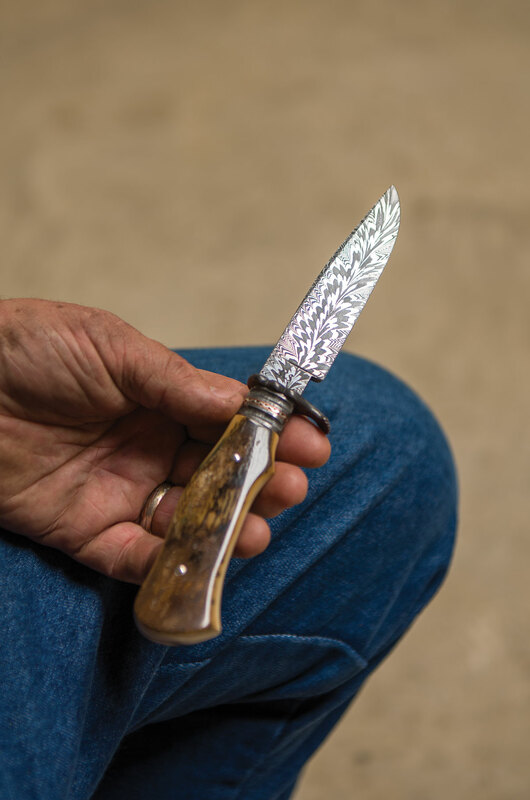 Vandeventer has forged many of these blades, but none more important to him than the one he made for his stepson. Vandeventer became a stepfather when the boy was twelve. 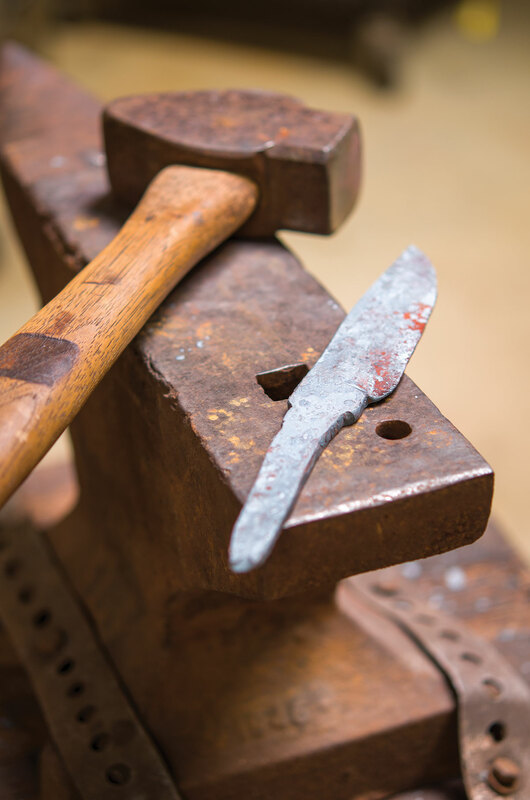 For years, the boy’s biological father gifted him a knife every Christmas. Vandeventer, out of respect, never gave his stepson a blade of his own making. But at a family celebration after the young man graduated college, Vandeventer produced a box. His stepson opened it and was in awe. He designed his first three prototypes in 2015 and traveled to Leon, Mexico, renowned for its leather manufacturers. He struck a deal for a small batch of goods, all made by hand, and the business was born in earnest in May 2016 when he launched Wren & Ivy’s first full collection. Buyers from forty-six states now own and use Wren & Ivy gear. “It’s not like you put raw materials in this end of the machine and a bag comes out the other end,” Rogers explains about the process. “It’s a pair of scissors and a sewing machine… The outside is material that could have been used a hundred and fifty years ago.” Waxed twill canvas. Vegetable-tanned bridle leather. Solid brass. The older it gets, he explains, the cooler it’s going to be. “Inside the bags you might find a ballistic nylon, … a military-spec pack cloth that’s waterproof.” Wren & Ivy is built to last. The reason why you want it to last is because it’s that totem, whether it be a gun case, a duck strap, or a briefcase. It’s the thing that you had in all of those memories. It was the thing that was with you the whole time. That’s why I think people are drawn to items they can keep. Those scratches and those wear marks become part of the story. When you get B.C. Rogers talking about faith and family and the wild, the renaissance man becomes a Southern poet and preacher. These heirloom objects move him. Like duck calls move Josh Raggio and knives move Terry Vandeventer. They represent a primal connection to the mud from whence we came. The building blocks of who we are. Sponsored by Seafood R’evolution in Ridgeland and hosted by award winning chefs, John D. Folse and Rick Tramonto, this cooking demonstration event is inspired by the book After the Hunt: Louisiana’s Authoritative Collection of Wild Game & Game Fish Cookery by Chef John D. Folse. After the Hunt explores man’s development from the caves where he first fashioned tools and traps to the cultivation of his gluttonous taste for wild game and grand banquets. Special guests B.C. 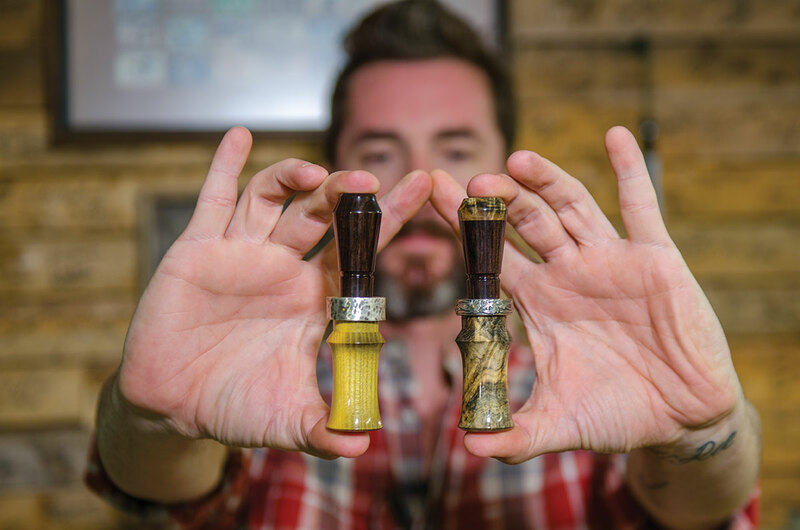 Rogers of Wren & Ivy and Josh Raggio of Raggio Custom Calls will be on hand to showcase their products and share the experiences that drove them to develop handmade hunting gear and accessories. Includes 5-6 menu items from the book that are prepared fresh and served to attending guests. Attendees will also receive a packet of the recipes demonstrated during the event. This educational experience is $75 per person and includes a tasting of each dish (including wine and a featured cocktail). In addition, copies of After the Hunt will be available for purchase and may be personalized and autographed following the demonstration. For reservations call Seafood R’evolution at 601.853.3474. We feature two recipes from Chef John D. Folse’s Cookbook After the Hunt: Louisiana’s Authoritative Collection of Wild Game & Game Fish Cookery on our website. See the links to the recipes below.